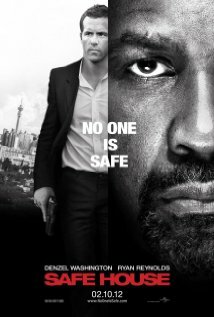 Denzel Washington and Ryan Reynolds star in the action-thriller Safe House. Washington plays the most dangerous renegade from the CIA, who comes back onto the grid after a decade on the run. When the South African safe house he’s remanded to is attacked by mercenaries, a rookie operative (Reynolds) escapes with him. Now, the unlikely allies must stay alive long enough to uncover who wants them dead. This movie being set in cape town, south Africa was a good choice , had good scenery . Denzel Washington was excellent in his role as always , Ryan Reynolds also put up a good performance. It has non-stop action and the story line will keep you at the edge of your seat. Some of the action scenes were seemed force and not really necessary. Matt Weston: Don’t Worry, I’ll take it from here. Tobin Frost: First rule is to protect your house guest. I’m your house guest. It is not the best movie Dezel Washington has stared in , but it is still a very good movie. The story line has twists and turns , it is not predictable . Ryan Reynolds was great in this movie , in most of his other work he is some-what of a comedic character ,but in this one he had a more serious role. He plays of a young, idealistic and ambitious field agent on his first assignment that is desperate to impress and get out of the boring ‘babysitting’ safe house job. :) An entertaining movie which is why we go, isn’t it. I enjoy Denzel and Ryan Reynolds gave a good performance in a serious vein. It’s the first movie I have seen him in and I think he could be a good Jack Ryan or maybe a a Jason Bourne if given the role. Lots of action, explosions and gunfire. I always have a problem with these scenes where millions of bullets fly but no one seems to get hit and where a pistol holds an unlimited number of rounds but everyone seems to do it. I knew five minutes in who the bad guy was going to be, though. The show is worth a couple of hours. Go see it.